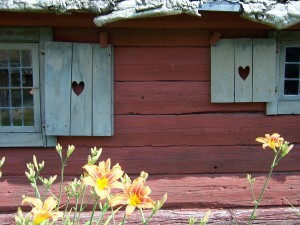 Today, the island is most celebrated as a vacation destination and for its beautiful farmland and beaches. 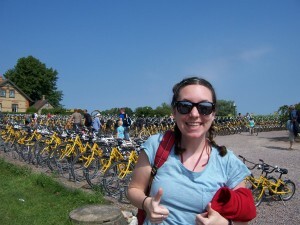 After disembarking from our ferry we all rented bikes and spent the afternoon biking around the island. 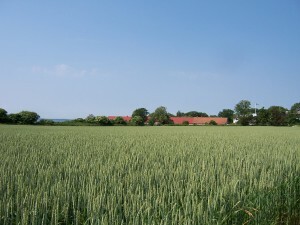 It seems almost every Scandinavian creation story involves a giant and Ven is no different: the story goes that a giant woman called Hvenhild lived in southern Sweden many years ago. She thought the landscape was too flat and could be improved by real hills. She filled her apron with earth from Zealand and waded back to shape the hills, but on one of her trips the apron broke and the earth fell into the water creating the island of Ven. 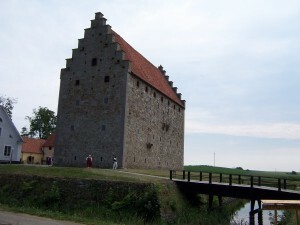 The next trip we took, we drove to the southeast corner of Sweden to visit the medieval fortress, Glimmingehus. 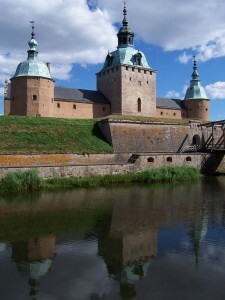 It’s the best preserved medieval castle in Scandinavia. Once again, we were fortunate enough to have an excellent guided tour and we learned about the Danish knight who’d built it (back then southern Sweden was part of Denmark) and the various grisly details that made the castle so impenetrable. The stronghold is encircled by a moat and back when it was built the surrounding countryside was all marshland, which meant invading armies had nowhere to camp. The walls of the fortress are 2.4 meters thick and the stone steps inside are especially steep so that the chain-mailed warrior defending the castle would have the advantage swinging his heavy sword down, while his invading opponent, exhausted from climbing such steep steps would have difficulty striking above his head. You can still see the “murder holes” above the door where boiling oil was poured down and the slender notches in the thick stone walls from which arrows were fired. Our guide also regaled us with some fascinating (if fanciful) ghost stories that have been passed on through the years. One tells the story of a Danish girl who fell tragically in love with an invading Swedish soldier. When her family learned of her treason, they had her sealed up alive within the walls of the castle. There is an eerie stone seal of a knight over the place where she was supposedly locked up and there is indeed a cavity behind the seal. It is said that you can hear her cries at night, begging to be let out of the wall, and the story goes that once an intrepid nightwatchman stuck his hand in the hole from which the cries were emanating and felt the long strands of her hair. You can see the hole to the left of the guide. There’s another story about one of the nobles who lived in the castle who was so devoted to his dog that when he died, he insisted the dog be buried in the church beside him. This was of course, sacrilege, since dogs aren’t supposed to have souls. They say that the ghost of this dog spends nights wandering between the castle and the village in search of its master, and if you see the dog on the road at a night (a big, black, hulking thing), at all costs avert your eyes, because if the dog looks straight at you then a terrible fate will not befall you, but rather the one you love most in the world. There was another disturbing story about the ghost of a girl who’d had an abortion and whose soul apparently had taken the form of a headless chicken, forever running back and forth in the attics of the castle, searching for her lost child. All in all, it was a pretty fantastic visit. The best part is, during my last two weeks in Sweden, I stayed with my Swedish family who own a house just four kilometers down the road from Glimmingehus. My brother and I would go running to there. Seeing it emerge through the mist, standing alone amidst vast fields and sky, it was easy to imagine we were back five hundred years when the castle was still in use. 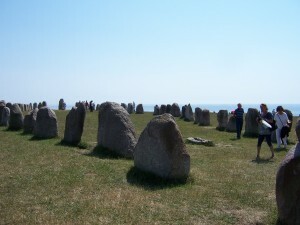 The last trip we took with my Swedish language class in Lund was to Ales Stenar, which is best described as Sweden’s Stonehenge. Up on a cliff overlooking the sea, there is a ring of giant stones that make the shape of a Viking ship when viewed from above. No one knows exactly what the monument is for-whether it is a king’s burial ground, an astrological device, or a monument to something else entirely. Little has been learned from archeological investigations. No matter what their purpose, the stones are impressive. 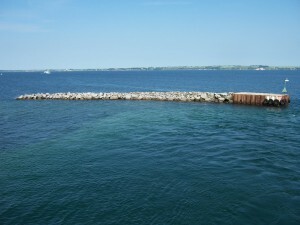 There are 59 boulders total forming a ring that stretches to 67 meters in length. The view of the sea all around is magnificent and the wind only lends to the feeling of timelessness and mystery. Just down the hill from the stones is the little fishing village of Kåsaberga where we dined on several varieties of smoked fish- the local speciality. 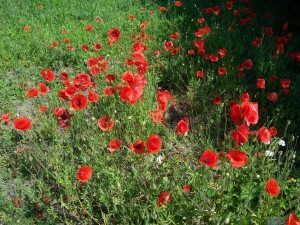 When we visited, the poppies were in bloom and the surrounding fields and hillsides were full of them. 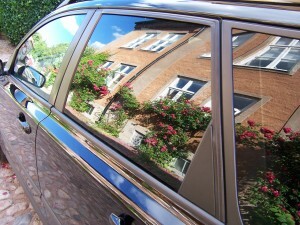 Here are some more pictures from daily life in Lund. 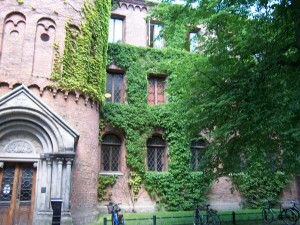 Two photos of one of the oldest university buildings, which dates from the 17th century. It has the most magnificent wooden spiral staircase going all the way up the tower. There’s a story about a king riding his horse all the way up the stairs, only to shoot it once they reached the top floor because the horse couldn’t go downstairs. 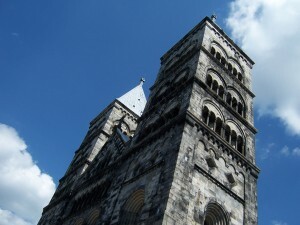 Lund’s magnificent soot-stained, Romanesque cathedral, which I passed every morning on my way to class. I got chills every time the bells tolled. 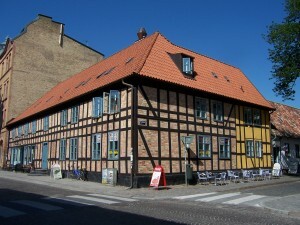 A typical building in Lund. 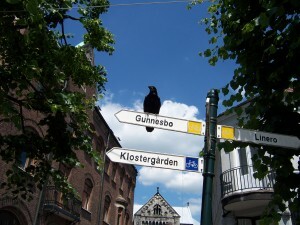 A photo of one of the many, ubiquitous black ravens that is typical of southern Sweden. A view out the window of the apartment where I lived. 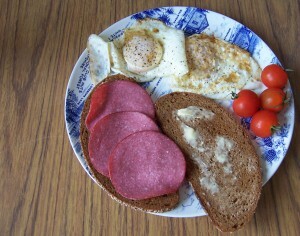 Here’s a photo of one of the meager meals I cooked myself during the first week. Simple, but quite tasty. Swedish strawberries are the best in the world. They’re sweeter because they have more hours of sunlight to ripen. 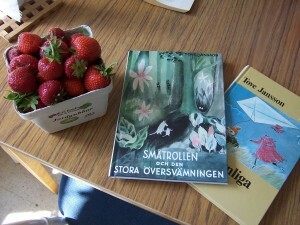 Two children books I bought to practice my Swedish. I’m sad to say that the last day of the paradise of traveling and writing has come to a close and I am now back in Boston getting ready to finish up my MFA and looking for employment. 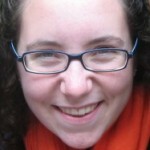 However, that is not to say that I am done posting in this blog. Unfortunately I had virtually no internet access during the last three weeks of my trip so I was unable to post a thing, not even a measly photo! But now that I have returned to the land of endless wi-fi, I plan on posting a whole lot of pictures and hopefully some more thoughts from my travels. I’d like to backtrack a little and post some of my favorite photos from my three weeks in Lund, at the very beginning of my trip. 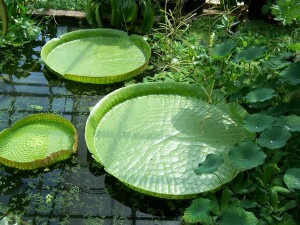 These two are from our tour around Lund’s Botanic Gardens, inside the greenhouse. 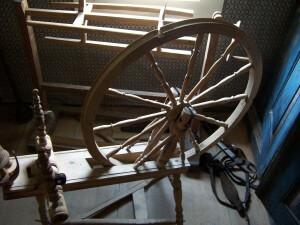 The next few are from our tour of Kulturen, Lund’s open-air museum, which is one of the oldest in the country. It falls short of being the oldest by only a few months, Stockholm’s Skansen wins in this category, a fact which our energetic tour guide was reluctant to divulge. 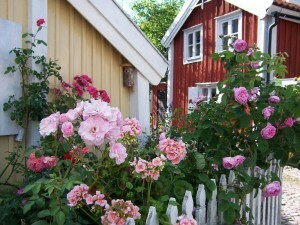 The buildings were brought together from all over the southern part of Sweden and the museum opened in 1892. 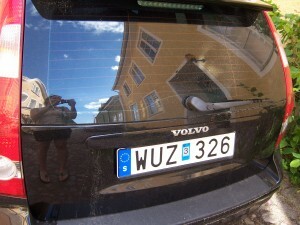 July 27th, 2010- The Island of Marstrand and some photos! Even though I already posted today, my computer is finally allowing me to post some of my pictures here, so I am seizing the opportunity and doing it now! I also thought I’d make quick mention of where I am. I left Göteborg this afternoon and am currently on the island of Marstrand just off the west coast of Sweden, about an hour north of Göteborg. 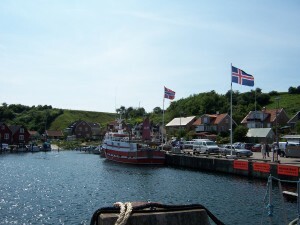 It’s a beautiful old fishing village that was founded by the Norwegians, then controlled by the Danish, and was extremely prosperous up until the 18th century due to its herring fishing. 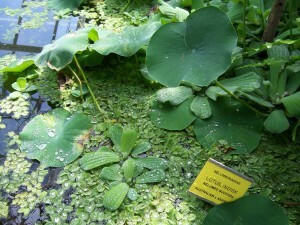 In the 1800s it became a popular spa destination where all the wealthy people came to see and be seen. I’m staying in a youth hostel that is a converted bath house from the turn of the century. It’s right on the water and as I sit and type this, I am sitting on the second floor next to the window in a big open room with exposed beams in the ceiling coming down the floor. Outside I can see boats gliding by and the sky is just now stained with pink at the edges, at 10 o’clock at night. Youth hostels in Sweden are so well-run and nice that a lot of families stay in them (as opposed to other European countries where you’ll find mostly poor young people), and the one I’m in now is filled mostly with vacationing Swedish families. This one in particular has a lovely, lodge-like feel to it, and in the same room where I sit and write this, there’s a group of people on beat-up couches gathered around a British murder mystery series on TV. It feels very cozy. It looks like mostly Moms and teenage daughters watching. There’s one older woman in slippers who just came and quietly sat down with a cup of coffee. The island is also known for its fortress, an imposing stone tower that sits on the highest point of the island, which served as a prison for many years. Its most famous prisoner was a man named Lasse-Maja, who was the equivalent of the Swedish Robin Hood. He used to disguise himself as a woman to seduce rich men, then steal from them and give the money to the poor. When he was finally caught and imprisoned in Karlsten, there’s a story that he used his cooking skills to get out of prison. 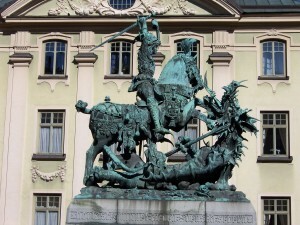 There’s another story that he charmed King Carl XIV himself, when the King was visiting. 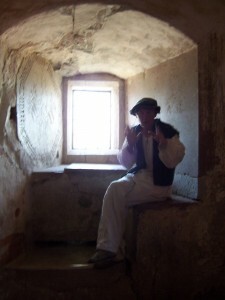 I plan to find out the truth tomorrow when I take one of the guided tours around the fort. Unfortunately, they only offer tours in Swedish, so we’ll see how much I understand! I have the perfect reading material with me for my two nights on the island, both books about thieves imprisoned in grim fortresses: The Lies of Locke Lamora by Scott Lynch and The Thief by Megan Whalen Turner, which is a book I’ve been searching for FOREVER and found just this morning in the awesome sci-fi/fantasy bookstore in Göteborg. Sweden has the best English bookstores! Alright, that’s all I have time for tonight. Hopefully, I can post more photos soon! I’ve now been traveling around Sweden and Norway for more than a week and I wanted to write about one of the strange phenomena that I continue to experience as an American in Europe. While traveling I always strive to see things outside of the regular tourist circuit. I don’t want to be the person wearing a baseball hat, white sneakers and a fanny pack loudly asking directions to the nearest McDonalds. I want to get an idea of what it’s like living in a particular city or town, to discover what is authentic in that place. This is probably what every traveler is searching for, but more and more in this day and age it’s difficult to get away from the tourist track. Sadly, I’ve discovered that in Sweden (as in a lot of Europen countries) even when you *do* manage to get away from the trinket shops and the tour buses, what you find is that all the cool stuff (the things that all the locals do) is American. I experienced this while we were in Stockholm. Our hostel was in Gamla Stan (which translates literally to Old City), which is full of beautiful old buildings and twisting cobbled streets, but it’s also full of a lot of junky shops selling Viking helmets and Moose Crossing signs and “I Love Swedish Girl” t-shirts. There’s one street that’s particularly bad called Västerlånggatan; if you try and walk down it in the middle of a summer afternoon you’ll find yourself caught in a human traffic jam of pedestrians ambling along at what I like to call, “Ice Cream Eating Pace,” and walking into each other as they gaze in all the gaudy shop windows. 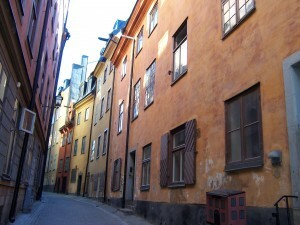 In spite of this, Gamla Stan is still my favorite neighborhood in Stockholm. Many of the streets are so narrow the sun hardly reaches down in the middle of the day, and the buildings still bear the marks of their medieval past and the wealthy merchants who lived there—over certain houses you can see the symbol of a phoenix—those were the houses that had insurance and would be saved in case of fire. The neighborhood is also home to Stockholm’s Royal Palace and Storkyrkan, the church where Sweden’s crown princess married her personal trainer in June. We spent a lot of time wandering around Gamla Stan, but by our second day we decided to wander into the city’s southern island, Södermalm. 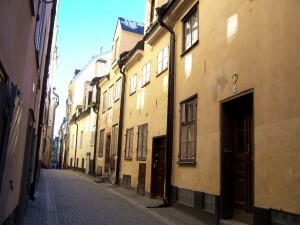 This is the neighborhood that many guidebooks refer to as “young, hip, and trendy.” We had the most fun there because to us it was the neighborhood that felt the most authentically Swedish. We knew that this is where we’d be living if we moved to Stockholm. It was full of vintage clothing stores and record shops, vegetarian restaurants and coffee bars, and lots of interesting people. The vintage clothing stores were our favorite but it in almost all of them they were playing American music (one was playing a Johnny Cash album) and all the most expensive, coveted shirts were American, t-shirts that said things like, “I’m a county-wide hero! I gave blood to the Monroe County blood bank!” I pictured a Swedish teen wandering around in that shirt and figured he’d look pretty cool. All the big coffee chains in Sweden have painfully American names. “Wayne’s Coffee” is the most expensive and exclusive. We saw another in downtown Stockholm called, “John Chris Coffee.” The exterior was done up in elegant silver letters and low-gold lamps burned on the inside. It’s not just funny because a coffee place named “John Chris Coffee” would never do well in the states, it’s funny because in Sweden these places with the most humdrum American names are the most elegant. It’s because American right now is in. 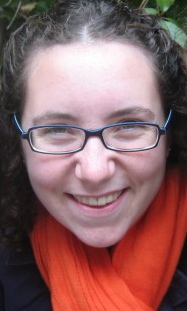 And it gets to be kind of disappointing when you’re an American traveling abroad. I left home to get away from American things, and now I find it everywhere, no matter how far I travel. Probably the funniest (and most disturbing) example of this problem is McDonalds. I never eat at McDonalds in the states; like most morally-conscious Americans who are lucky enough to live in a part of the country where McDonalds isn’t the only option, I tend to avoid the place. To me, it is the ultimate symbol of corporate evil and America’s monopoly around the globe. But when I go to Europe, I find McDonalds fill an entirely different role, especially in big cities. I remember it was like that in France. When I studied abroad in Toulouse I remember how shocked I was when I saw that McDonalds there were clean, well-maintained, almost elegant establishments. The seating was comfortable yet stylish looking (some time of plush, red bench) and there were plasma TV screens on the walls. If you were a French teenager, the cool place you went to hang out at night was McDonalds. As my friend Rose pointed out, it’s probably mostly those teens who are too young to get into bars or clubs, but still, the whole feel of the place is different. The same was true of the McDonalds we saw in Stockholm. There was one in particular we passed a lot, located next to the bridge that connected Södermalm to Gamla Stan. One night, around midnight, we were walking home over the bridge and I joked to Rose that we should hit up McDonalds, like all the cool European youths. We glanced at it as we walked past and were amazed to see a crowd of people outside, and even more swarming in the brightly-lit interior. We decided we had to check it out, and as we approached we kept joking about whether there would be a bouncer or a cover charge to get in. We edged our way in past a crowd of smoking, black-clad youths, and thus entered the liveliest McDonalds I had ever seen. It was a hive of activity. All the tables were filled and there were movies playing on screens on the wall. Every age and background was represented—there were scrawny adolescents listening to mp3 players, even younger-looking kids throwing ketchup packets at each other, older men chewing seriously on hamburgers, teenage girls reapplying lipstick and woman sitting next to their shopping bags, talking loudly. We joined the line of people waiting to order and there were so many people already waiting that it took almost ten minutes before we got to the counter. While we waited in line we talked to a blonde boy standing next to us, who was wearing a red plaid shirt (every man in Sweden seems to be wearing plaid this summer). Rose tried to ask him why that was but he couldn’t understand what she meant by plaid. We also witnessed some kind of fight that broke out between a large Swedish man and a gang of smallish looking boys—I guess it wasn’t so much a fight as a yelling match. Apparently, they had been making a mess and he didn’t approve. It seemed pretty dramatic at the time. The next day at our hostel, we were trying to explain the bizarre nature of McDonalds in European countries to our Austrian roommates. They didn’t really understand. They couldn’t get around the fact that we said we never went to McDonalds back home. “But I thought everyone went to McDonalds?” We were also staying with a boy from Australia. He told us that McDonalds had a similar status in Australia as it did in European countries. “It’s not like you really want to go there, you just go! Or, it’s not like you go there because it’s good. But everyone goes.” He told us a story about how one time his entire boys preparatory school swarmed a McDonalds (except that he kept referring to it as ‘Mackers’). “It was total chaos! There were boys standing on the condiment bar smoking cigarettes and people doing cartwheels. And everyone was still in uniform so it looked even more insane. We started a mosh pit in the line to the register.” He got really eager when he was describing the scene—I feel like some of the energy from that day was channeling through him as he told the story. It’s one of the nasty results of globalization. I get really depressed when I think about it, but then again, that story about the entire class of Australian preparatory students forming a mosh pit in the line at McDonalds has been making me laugh for a week. I’ll try and write about something less doom-worthy next time. 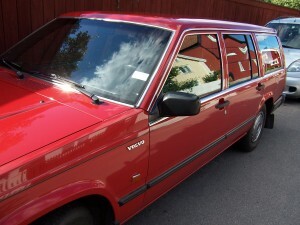 For all the American influences, this country is still Swedish to the core. Last night, I bid farewell to my friend Rose at the Oslo train station under a rainy sky and boarded a train for Göteborg, where I am now, currently writing from my pleasant youth hostel. Rose and I had a whirlwind week of travel, first spending two days in Lund then traveling to the east coast to the city of Kalmar (which had a spectacularly preserved Renaissance castle), then traveling further north where we spent three days in the magnificent city of Stockholm. From Stockholm we took the train to Oslo and spent one night, then the next day took the most spectacular train ride of my life west across Norway to Bergen. We took a boat through the fjords which was indescribable. For the first time in my life I felt the limits of our feeble, two-dimensional human vision. We reached Bergen by nightfall (though when we arrived at 9:30 it was as bright as the middle of the afternoon) after a harrowing bus ride down the side of a mountain and then another journey by train. 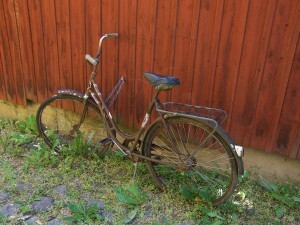 Bergen was lovely, full of character. I’ve never visited any city quite like it. It feels like a small town and it’s tucked right in between pine-covered mountains and sits on a harbor filled with boats. I have so many things to say about our whirlwind week, but hopefully I will get a chance to do another post soon! I’m coming to the end of my three weeks here in Lund and I can’t believe how fast the time has gone. Tomorrow I have my final test for Swedish class and then on Sunday I’m off to travel around Scandinavia for three weeks, before meeting up with some of my Swedish family back in Skåne (the southernmost province of Sweden) in August. I’ll be traveling with my good friend Rose the first week, and then I have two weeks of solo traveling. I’ve traveled alone for a few days, but never as long as two weeks, so we’ll see how it goes! I’m sad to be leaving Lund and sad that my Swedish classes are over. Things were just beginning to feel like they were starting to stick, so I hope I’ll be able to practice some of my Swedish while traveling. I can now order a coffee and a kanelbulle! I can ask for directions! And I can tell people my name, age and where I’m from. Pretty basic stuff, but the day after we learned how to make complete sentences, I felt like I could get to work. The awesome thing about Swedish is that they do not conjugate their verbs. Also (and I think this is very telling about Sweden in general—as a country that’s obsessed with equality) they are adamant about the fact that their nouns are not gendered. Nouns take the article either “en” or “ett” and just like French, Spanish, or German, it’s impossible to determine which is which, it’s something you just come to know. As far as I can tell, the concept of “en” words and “ett” words is no different than the concept of “un” and “une” in French, or “un” and “una” in Spanish—basically what other languages refer to as “gender.” I imagine people refer to nouns as gendered because it’s an easier way of talking about them, but in Sweden they take the matter very seriously and seem to be almost proud of the fact that gender has nothing to do with it. Another great thing about the language, they hardly every use commas! As someone who’s always struggled with the placement of this tricky little punctuation mark, it’s a relief to not have to worry about it. In fact, Swedish is not too concerned with punctuation at all. They don’t use apostrophes either, when something is possessive, you just stick an ‘s’ on and you’re good to go. Sadly, that’s all I have time for today! I have lots more to post (including tons of pictures) but they will have to wait for another day. I have more verbs to study! I’ve been in Sweden now for almost a week and things are going well! I arrived last Sunday in the afternoon and due to my extremely jet-lagged state, I was fortunate to have someone come and meet me at the train station in Lund. Lund is a small, university town in southwestern Sweden, often referred to as “the Oxford of Sweden.” It’s very old and during most of the year it is filled with students. Geographically, it’s not far from the ocean, and it’s only about an hour train ride over the newly constructed bridge (you used to have to take a ferry) to Denmark’s capital, Copenhagen. 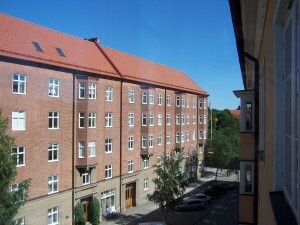 Thanks to a series of unfortunate events, I am living with a lovely Swedish girl, about my own age, in an old apartment building in Lund, about a ten-minute walk from the city center. I was originally planning on subletting a room from a university student who is away in Canada for the summer. However, two days before my departure to Sweden she sent me an email informing me that the window on the room I was going to rent had blown off—thus the room I was meant to be living in for the next three weeks was windowless. 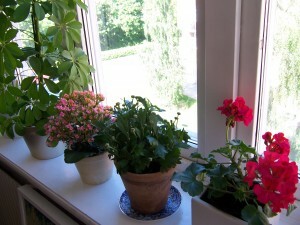 Luckily, she was extremely considerate about the whole thing and even though she was in Canada and could do nothing about the window, she contacted a friend of hers living in Lund and this friend was kind enough to let me stay with her until the window is fixed/for as long as I liked. I was hesitant to accept this offer at first since I had no idea who this person was or how far away she lived (I chose the apartment I did based on google maps and how close it was to my school), but now that I’m here and staying with her, it seems like a stroke of good luck that the window fell off the other room. Instead of coming home to my solitary student room, I now come home to someone who brought her charming, older father and his jack Russell terrier to greet me at the train station, and who invited me to have dinner with her family my second night in Lund. She bought a new bed for the room I’m staying in (she’d been intending to buy a new bed for the guest room anyway, but still!) and she put up a giant pad of paper in the kitchen to write down new Swedish words to teach me. 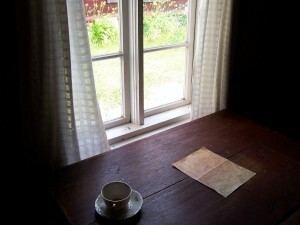 I started my Swedish language classes the morning after I arrived in Lund, at 9am sharp. 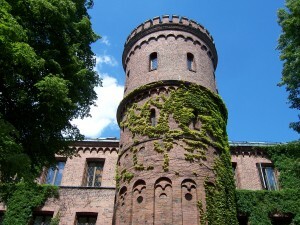 The name of the university is folkuniversitetet and they offer Swedish language classes to a variety of people in Lund. I am in a 3-week intensive, beginner Swedish course, mostly with other American students (I believe there’s one woman from England and two women from Germany) but most of the students are from universities in California, taking the class for foreign language credits. One of my favorite things about being in Lund so far is my Swedish language class—I love learning Swedish! The reason I’m so interested in learning this language is because my Mom speaks Swedish, and I’ve grown up listening to her speak Swedish with my grandmother, my aunts, uncles and cousins, never understanding what she said except for a word here and there. It’s a language that feels like part of my childhood—I’m used to hearing it as an indistinguishable but pleasant lilting string of cadences in the background, something I enjoyed listening to but never tried to understand—to begin untangling it now, breaking it down and figuring out what those sounds mean feels like a kind of magic that’s endlessly fascinating. Unlike French, which I always loved listening to but could never really get my mouth around, Swedish feels natural and easy on my tongue, especially the type of Swedish that is spoken here in the south, in the province of Skåne, which they call Skånska. This is the Swedish my mother speaks and the Swedish my grandmother spoke and maybe I’m biased, but I think it sounds the coolest of all the accents. Like my Swedish teacher said on the first day, Swedish is a singing language, the vowels are elongated and words are often strung together. I’ve always loved weird-sounding words and Swedish is full of them (the word for roommate is “rumskompis”). I have Swedish class every day from 9am until 12:30pm. We get an hour break for lunch and then there’s usually some type of cultural activity in the afternoon. So far we’ve had a walking tour of the city, a viewing of a Swedish film, and a lecture on Swedish film—all of which have been varying degrees of hilarious and enlightening. The guide for our walking tour was especially engaging—he told us the story of how the magnificent Romanesque cathedral in Lund was built, and about the various murdered priests they found in the walls. Lund is an extremely old city full of winding medieval streets and 17th century wooden houses, but sadly, in most contests of “oldest in Scandinavia,” Lund comes in second. 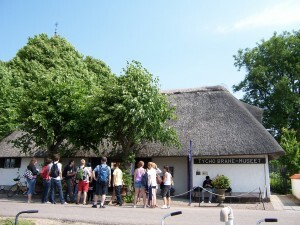 He pointed out the second oldest anthropological museum in Sweden, the second oldest open-air museum in Scandinavia and a statue outside one of the University buildings of a forgotten Swedish poet. Apparently he wrote a lot of sentimental, very pro-Swedish poems about the glory of the Vikings that nobody reads anymore. I find myself returning to this statue often—as bad as his poems may be I kind of feel for the guy. There’s lots more to say but I think this post is long enough already and I have to be up early tomorrow—we are going on our first field trip to the island of Ven where we are going to tour the island on bikes, learn about astronomy and swim! This summer I will be traveling to Sweden in order to learn Swedish, write, and hopefully absorb some of this beautiful country’s ancient mythology and folklore. The imaginative landscape of my childhood was shaped by Swedish children’s literature and fairytales, and these stories have had a profound impact on my writing. I hope to enrich my imaginative landscape once again by visiting the places where these stories originated. 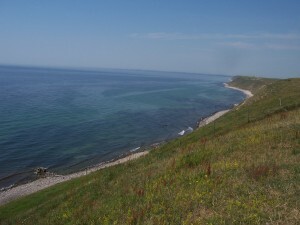 I plan to spend my first month taking Swedish language classes in the university city of Lund in the south, and then to spend the next month traveling up north to spend time in the countryside and visit some of the islands along the coast.